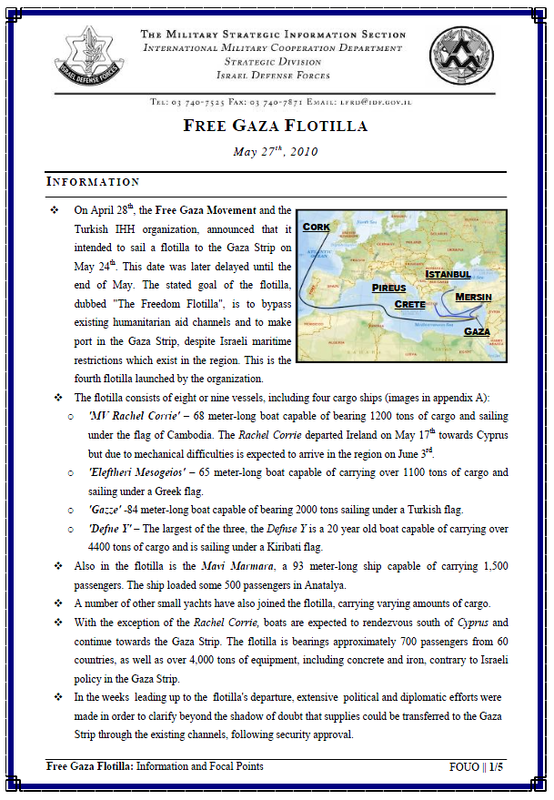 On April 28th, the Free Gaza Movement and the Turkish IHH organization, announced that it intended to sail a flotilla to the Gaza Strip on May 24th. This date was later delayed until the end of May. The stated goal of the flotilla, dubbed “The Freedom Flotilla”, is to bypass existing humanitarian aid channels and to make port in the Gaza Strip, despite Israeli maritime restrictions which exist in the region. This is the fourth flotilla launched by the organization. but due to mechanical difficulties is expected to arrive in the region on June 3rd. ‘Eleftheri Mesogeios’ – 65 meter-long boat capable of carrying over 1100 tons of cargo and sailing under a Greek flag. ‘Gazze’ -84 meter-long boat capable of bearing 2000 tons sailing under a Turkish flag. ‘Defne Y’ – The largest of the three, the Defnse Y is a 20 year old boat capable of carrying over 4400 tons of cargo and is sailing under a Kiribati flag. Also in the flotilla is the Mavi Marmara, a 93 meter-long ship capable of carrying 1,500 passengers. The ship loaded some 500 passengers in Anatalya. A number of other small yachts have also joined the flotilla, carrying varying amounts of cargo. With the exception of the Rachel Corrie, boats are expected to rendezvous south of Cyprus and continue towards the Gaza Strip. The flotilla is bearings approximately 700 passengers from 60 countries, as well as over 4,000 tons of equipment, including concrete and iron, contrary to Israeli policy in the Gaza Strip. In the weeks leading up to the flotilla’s departure, extensive political and diplomatic efforts were made in order to clarify beyond the shadow of doubt that supplies could be transferred to the Gaza Strip through the existing channels, following security approval. As per the Interim Agreement signed by the Palestinian Authority and Israel, an agreement supported by the international community, the sea off the coast of the Gaza Strip is subject to Israeli naval control and Israel is entrusted with maintaining security in the area. In accordance with mutually accepted agreement, the entry of foreign vessels into maritime areas off thecoast of Gaza is forbidden. As such, Israel has issued an advisory notice warning all foreign vessels to remain clear of the designated maritime zone. Entering this zone endangers the passengers of the boat and interferes with the Israeli Navy’s security efforts. Israeli security operations in the region, which focus on preventing terrorist infiltrations or mass weapon transfers, stem from accepted practices of self-defense and in accordance with agreements signed between the PA and Israel. The Gaza Strip is controlled by the Hamas, a hostile terrorist regime which refuses to recognize Israel, has made threats against Israel and continues to expand its military capabilities. Due to the threat posed by Hamas, certain limitations and restrictions have been imposed. These limitations extend to maritime channels as well. There is no humanitarian crisis in the Gaza Strip. Supplies continue to enter the Gaza Strip through the existing humanitarian crossings. These efforts reflect Israeli policy of cooperating with international organizations and ensuring ongoing assistance to the Gaza Strip. Since January 2009, the two ships which attempted to breach the naval blockade have been stopped in accordance with international law, and the goods onboard have been transferred to the Gaza Strip via the existing land channels. A similar offer has been extended to the organizers of the flotilla, who summarily dismissed it, reflecting the provocative objectives of the flotilla. Israel unilaterally withdrew from the Gaza Strip in 2005. Over the following two years, the Palestinian Authority failed to restrain Palestinian terrorism. Despite the ongoing attacks, which included the abduction of SSG Gilad Shalit, Israel voluntarily opted to allow virtually unimpeded passage of goods and persons to and from Gaza, subject to security restrictions. 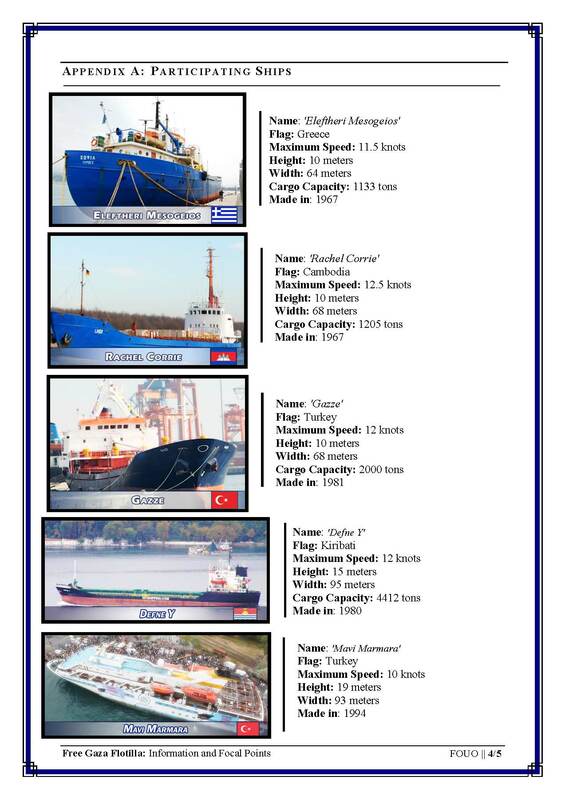 The flotilla is comprised of three major organizations: Free Gaza, ECESG and IHH. o Free Gaza Movement – An international human rights organization which sets its purpose on publicizing the Israeli blockade, as well as organizing flotillas with the intention of providing additional humanitarian aid into the Gaza Strip. o Insani Yardim Vakfi (IHH) – a Turkish pro-Palestinian human rights organization with a strong Muslim orientation. The IHH is a non-government organization which provides humanitarian relief into areas of war and conflict. o The European Campaign to End the Siege on Gaza (ECESG) – an umbrella body of non-governmental organizations across Europe which strives to raise the international awareness regarding the “Gaza crisis”, as their website calls it.